I worked for the VPRO radio for about 17 years. That sounds better than it actually was. I had a freelance contract for making a weekly radio show of a few minutes length. It was five minutes for the first 10 years, when the show was called Vrije Geluiden. Vrije Geluiden was an idea of Piet Schreuders and Wim Noordhoek. Piet made Vrije Geluiden weekly for about seven years. I was the biggest fan of the show, and when he felt he was running out of ideas, he asked me if I wanted to take over Vrije Geluiden. Later the name had to be changed because somebody else wanted to use the name Vrije Geluiden for his television show. Nobody within the organisation was aware of my show, and when it was discovered that the name already existed, it was way too late to changed it, and I don’t think that was ever an option anyway. The woman, who called me to explain the dilemma, had nothing to with it; that is how big organisations deal with problems. I knew that I was not in a position to do anything about it. So I asked what the name of the show was that the guy did before he came up Vrije Geluiden. It seemed like a nice idea that if he used my name, I would his name. The woman said that some people within the organisation would not be amused. Not wanting to make problems, I changed the name my show to Audio Archeologie. Making these ultra short radio shows was fun. I was completely free, as long as I didn’t offend people unnecessary or violated copyright laws, and as long the result was not over five/seven minutes. All these years I only got two or three minor complaints from within the organisation. In the beginning the show was mainly about music and sounds, and all the things that people did with it. I did a lot of research into neglected and marginal subjects, inventions, records and whatever. Later the show was more about ideas. In fact is was very much like this blog. But I write this blog on the spur of the moment, while for the show I took much more time. And I had help: Albert Ballintijn! 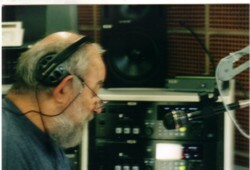 Albert Ballintijn was the technician when Piet made his first episode of Vrije Geluiden. When Piet noticed Albet’s warm and charming voice, he asked him if he was willing to read the texts too. Albert is a wonderful man, and of course he did. It was his one and only job as a radio show host. And he never got paid a cent for it! I have almost all the episodes of Vrije Geluiden and Audio Archelogie on cassette, minidisk or DAT-tape. Including all the episodes that Piet Schreuders did. It is not all that interesting, and I don’t think I will ever make a DVD with the complete recordings, but I did make a few compilation CD’s. One CD with the best of Vrije Geluiden, and four CD’s with episodes of Audio Archeologie. I could make mp3’s of all this and burn them on one CD. If you want copies of that, just make me an offer I can’t refuse. Here is an episode of Vrije Geluiden that Albert enjoyed doing very much. 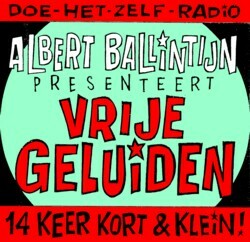 I’ve met Albert once, when I was being interviewed for VPRO-radio. He looked completely different than the face I imagined with the voice, but in fact he was so much nicer and friendlier than I had imagined too. I never knew about the story behind the name “Vrije Geluiden”. Yes, that’s how big organisations deal with such matters! You have no idea how many people loved Vrije Geluiden. no idea.